A weekly farmers market in Berkeley slated to once again take place this upcoming Saturday has been called off amid scheduled political protests, according to reports. 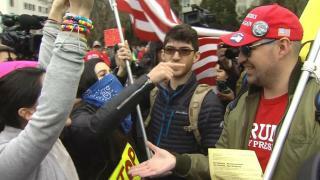 The threat of a potentially violent clash at Civic Center Park between supporters and detractors of President Donald Trump prompted the organizers of the Ecology Center Farmers' Market to cancel the event. A "Patriot's Day" rally featuring Trump supporters is slated to start at 12 p.m. at the park, according to the event's Facebook page. A counter protest organized by folks on the opposite side of the political spectrum is scheduled for 10 a.m. at the same location. The scheduled rallies come on the heels of violent clashes between police and protesters when controversial speaker and then-Breitbart News writer Milo Yiannopoulos came to the UC Berkeley campus in February. Bloody protests also marred Berkeley in March during a "March 4 Trump" rally.